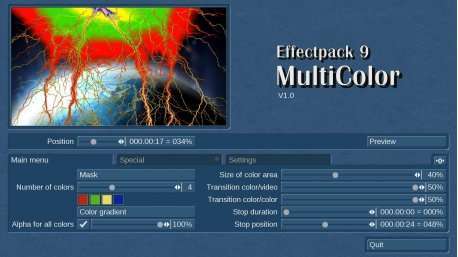 Effect Package 9 - Multicolour brings a combination of speed, colour and an enormous dynamic in its flow of fresh air to the world of video effects. Multicolour obtains its strength by short transition times between two scenes. The combination of specially created masks and a choice of colours brings a special dynamic in your videos that will delight any viewer. The use of multicolour is incredibly easy and leads always guarantees spectacular results: select just one of the many supplied masks, number of desired colours (up to 10 colours are possible) and adjustment of colour values ​​... finished the effect. Other options such as opacity, gradient or mask rotation You can make further adjustments and refine your effect. 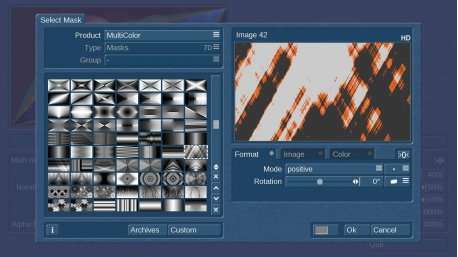 Users with active Spice Creator can also use self-created masks in Multicolour. Due to the rotation and the colour animation is thus an almost infinite number of different variations allows the transition. 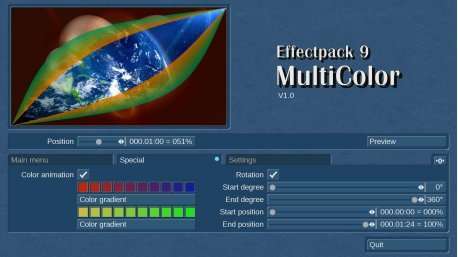 The effect package 9 - Multicolour can be tested as a demo version, to make sure of the many possibilities and ease of use.